You would normally not expect a green gemstone to be very popular in mens rings but, peridot is really different. One of the very ancient gemstones known to man, peridot has been known to Egyptians since the time of the Pharaohs. The gemstones belongs to the olivine mineral family and has a color and beauty that is completely natural. Green is the color of nature, it is a color that never appears loud and flashy when created by nature. This is one of the prime reasons for the popularity of mens peridot rings in gold and sterling silver. Most peridot gems have a prominent green color with just a hint of yellow. Almost all peridot gems have their origins in fiery volcanoes. They are formed deep down in the mantle of the earth, it is the volcanic activity that pushes them upwards towards the surface of the earth. Many experts believe that meteorites have in some very rare cases, contained deposits of peridot. However scientifically speaking, olivine (the mineral) when it comes from meteorites should be too small to have any use in gems and jewelry applications. If you see the color and beauty of the gemstone in a mens peridot ring, you will be surprised and pleased to know that no manual enhancement of the gemstone is done or necessary. In a world where most gems are treated to improve their beauty, the fact that peridot is left untreated is bound to add to it's value and demand. A handsome mens peridot gemstone ring with diamonds. This peridot ring for men can be ordered in gold or silver, you can also choose a range of gemstones for this design concept. Each peridot gemstone is handpicked and custom cut, the jewel is crafted by some of the finest craftsmen and artisans. The mens peridot ring is available in all ring sizes. Over the ages, peridot that was mined has shown some specific features. Peridot that was mined many centuries ago, often showed a cloudy or milky appearance. Most of the peridot that later came from the mountains in Pakistan, had a tremendous color but, very few of these pieces came without inclusions and fissures that could be seen with the naked eye. After centuries of mining, peridot gems that come from the earth today, show fine specks of blackish inclusions. So if you get one such gemstone in your peridot mens ring, do not be too concerned. The fact that the specks do not affect the beauty or value of the gemstone is something that, has discouraged gem manufacturers to experiment with gem treatments to eliminate the specks! The MAN64P is a handsome mens ring with peridot gemstone. 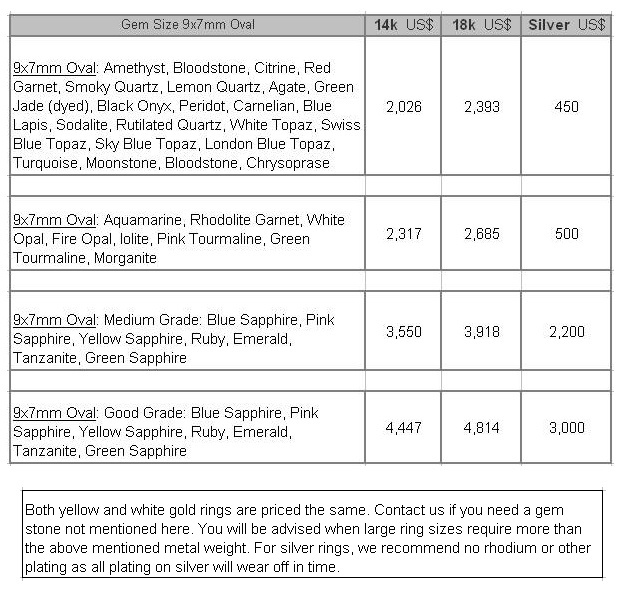 At Kaisilver we have sold many mens rings with this design concept, buyers can choose from a range of gemstones as shown in the table below. When it comes to green gemstones, there seems to be a natural attraction - little sales talk or marketing hype is required to move the jewel. There are various stories that have been attributed to peridot gems, ancient traditions like birthstones are strong even today. The birhtstone charts list peridot as the birthstone for the month of August. Having said that, the general appeal of this natural green gem draws a wide range of buyers - very few of these buyers might have been born in the month of August. But, if you happen to be born in this month, a gold or silver peridot mens ring would have special meaning for you. Don't forget that the practice of choosing a birthstone for a wedding or engagement ring, has become extremely popular in recent times. As an extension of this trend, young couples today exchange their birthstones in their respective rings. The portion behind the finger has a width of around 5cm. The ring is built and designed to be tough and long lasting. If you have a fairly indepth knowledge of gems, you might know that many gems show their gorgeous color only when seen in sufficient light. Most experts agree that the color of peridot can be seen and appreciated even in the evenings when, the sun is not exactly at it's brightest. This is the reason why the ancient Romans called peridot the 'evening emerald'. Talking about emeralds, history has another interesting fact that is often narrated when peridot is the topic of discussion. Cleopatra the influential Egyptian, was very fond of emerald gemstones. Unfortunately she lived in a time when, gem color was the only feature that could be used to identify a gemstone. This resulted in some rather amusing mistakes, when her 'emeralds' were tested in recent times, some of them turned out to be peridot. 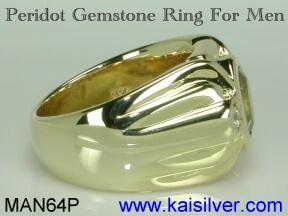 Now back to the MAN64P ring, this awesome jewel is crafted in gold or 925 silver. Like all other Kaisilver jewelry, we maintain the same quality of design, gemstones and craftsmanship for the gold or sterling silver peridot ring. The center 9x7mm oval faceted peridot gem, is handpicked by our experts - we do not limit our selection to fixed inventories and this means that, you get the best stone for the money that you spend. Given the impressive design of this mens peridot ring, many of you might feel that the 2.5mm round diamonds on either side of the peridot are sheer extravagance. But in our humble opinion, it is these diamonds that serve to contain the absolute beauty and grace of the peridot. This ensures that you see the overall impressiveness of the ring rather than, limit your vision to just the gem. Many jewelers proudly announce that their 'broad and impressive' mens rings are made with substantially low metal weight. What they do not tell innocent buyers is that, reduced metal weight means a reduction in longterm toughness of the jewel too. Our experts decided to make an impressive ring and boldly, invest the precious metal required to make the ring strong and sturdy. The mens gold peridot ring, has a metal weight of 20 to 25 grams. When it comes to sterling silver, the lower specific gravity of silver implies a metal weight of around 15 to 20 grams for the same dimensions - and this is what we have invested into the mens peridot 925 silver ring. The handpicked peridot, glittering diamons and healthy metal weight, do not result in a cheap peridot ring but - we will rather maintain quality than merely compete on price. Most buyers would look at the impressive features of a mens peridot ring and decide to purchase but, there really is more that you should analyze and consider. If you see the way the oval peridot gem in the MAN64P has been mounted you would notice that, the entire gem is bordered with metal. This is the best way to mount the gemstone in a mens ring, the gem remains firmly mounted and the edges are protected from side impact. The healthy metal weight is well spread through the ring and this, gives the jewel strength and durability without making it appear clumsy and bulky. Since each gem is handpicked before being custom cut by our experts, we provide fine craftsmanship in terms of gemstone and metal mounting. 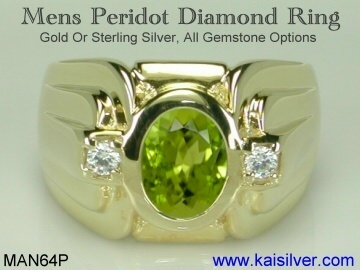 And this is true for the gold or 925 sterling slver peridot mens ring. We rely little on machines and mechanization and instead, put each jewel in the safe hands of some of the finest craftsmen and artisans. If you choose to order a mens silver peridot ring, we would suggest that you leave it unplated mainly because, any type of plating done on silver does not last forever. On the other hand if you do wish to have a white rhodium, yellow gold or even rose gold plating for your peridot gemstone ring - we can do it for you for a small additional charge. Gold Options: 14k or 18k Gold. White Gold, Yellow Gold, Rose Gold. 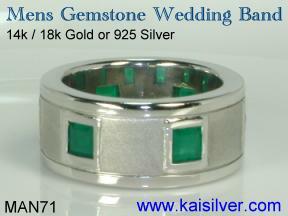 Silver Options: With or without rhodium or gold plating. Gem Options: All gemstone options available. Ring Sizes: Custom made in all ring sizes. Craftsmanship: Fine craftsmanship for gold and silver options. Modifications: All design modification requests are possible. The portion behind the finger has a band width of around 5mm. Metal Weight: Gold 20-25 grams, 925 silver 15-20 grams. Diamonds: 2.5mm round, 2 pieces. We have discussed various features of the MAN64P ring in this report, the gemstone discussed was peridot. But you can order the same ring with any other gem option too. While the price table covers a wide range of gems, we can also custom make your mens ring with a gemstone not mentioned in the list. You can discuss specific requirements with our support experts at sales@kaisilver.com We can procure any gemstone that can be found on our planet and custom cut it for you. Design variations are also possible and we can even make a completely different ring for you based on your design concept. Mens Emerald Ring ... more. 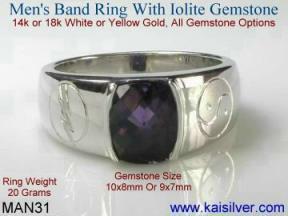 Mens Iolite Ring ... more. 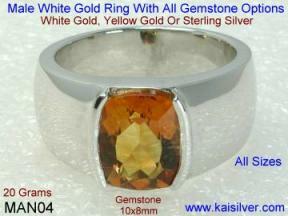 Mens Citrine Ring Gold Or Silver ... more.